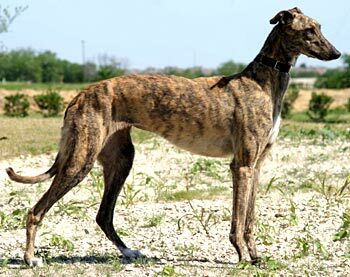 Tango is a stunning, approximately 3-year-old brindle female that was found as a stray in Amarillo by a family that had been trying to catch her for about six months. She would sleep in their flowerbed, but would not let anyone get close to her. Finally they were able to catch her and took her to the Amarillo Humane Society. Tango's ears have been double tattooed, so there is not any way to trace her true identity. 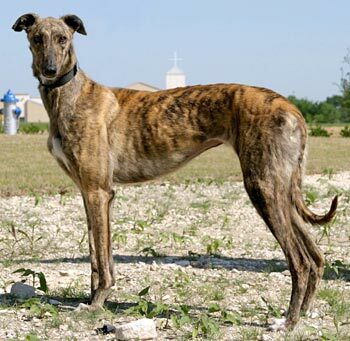 She was thin when she arrived, but has put on some pounds and is figuring out that her life with GALT is much better than sleeping in a flowerbed! Tango's cat test: Tango was interested in checking out the cat, sniffed, then backed off. She came back later for another look, but the cat swatted at her and she backed off. Later, when Dom was walking down the hall, she followed, but passed the cat and went on to other things. 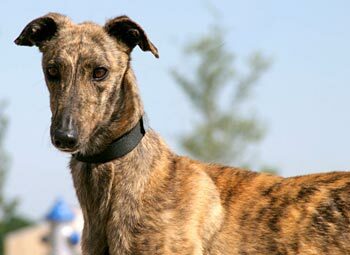 She is cat trainable, and close supervision is strongly suggested when introducing any Greyhound to a new family. Her introduction to small dogs will be at another time. Tango could be the poster girl for "a girl just wants to have fun." Blessed with an overabundance of redecorating genes, Tango nearly empties the toy basket of the 3 dozen toys daily, often moving any particular toy from one room to another until she get exactly the look she wants. Several toys in each dog bed seems to be an especially good look. Seriously though, Tango is learning the joys of being a companion rather than an athlete or a stray. Soft beds, undisturbed meals which just arrive for her pleasure, treats, loving rubs: Tango is learning that they are here to stay for her. Within the first two weeks she learned to take treats from our hands, and to stick around when it is treat time. She is just beginning to come around to ask for some loving-on-her time. She still doesn't stay around for long, but she is coming more frequently and trusting more. She greets us at the door with exuberant tail wags, and she is showing signs of thinking she might take over as alpha in the pack. She is just beginning to think that she ought to be first out the door for walks. Speaking of walks, she is quite polite on a lead and already is good about using walks as bathroom break times. Early in the morning, while we're preparing for our walks, Tango bounces around the house, with one toy after another, rearranging them so that they will be in their correct location when she returns. 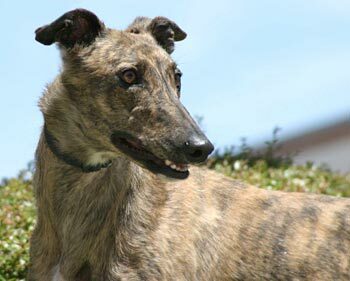 Tango is looking like a girl who is about to blossom into a greyhound with a loving, affectionate gentle personality; a girl with a goofy fun loving side; a girl who enjoys romping and playing with the others dogs in the house. Having been a stray for so long, she still is learning not to counter surf, as well as learning that she no longer has to scrounge through garbage bags or pick up chicken bones on our walks. However, she has had no accidents in the house, and she has not chewed on anything inappropriate. She is all these wonderful, emerging things and gorgeous besides. 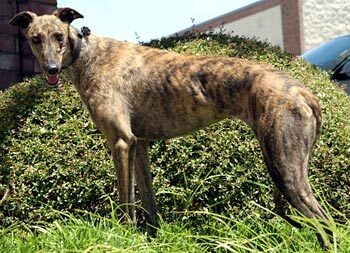 She has stunning, brindle markings on her face, an almost roman nose and brown/amber eyes. Both back feet are white and several toes on each of her front feet are white as well. Tango seems to be the whole happy beautiful package.